Re: Radiator fan (probably) bad, what else? Have you replaced your radiator hoses? Have you replaced the HOAT coolant if you had the Pt Cruiser since it was new? No to both. I was thinking it might be good to change the hoses now, but I wonder if it is worth removing and replacing the radiator as well? And I bought the car with about 40K on it, so the coolant has not been maintained. In for a penny, in for a pound. Replace the radiator, and the coolant? Worth it? I doubt it, but I will already be in there... I had to change the relays this spring, and that was easy enough. I looked at a fan swap video today, and I am worried I might not have enough daylight today to get it done. I looked at this a little more this afternoon. The fan is spinning freely by hand, and it didn't feel anything broken inside the housing. I noticed the problem Saturday when I heard what sounded like a small air leak that lasted about 2 seconds after I turned off the engine. This morning, it sounded like a blade was hitting something inside the housing. Now, back to nothing... Any ideas on what else would make that kind of noise? Any ideas on what else would make that kind of noise? Could be anything from a dead leaf to a chunk of radiator popping out to a mouse that fell asleep. Start and run it to temperature and check that the fan cuts in OK, and if it does, and it's not overheating or losing coolant follow the old adage of if it's not broke don't fix it. Coolant... easy job (provided you take your time burping it) and worth changing just so you know, but I wouldn't go ripping it apart unless I had to. Is there a quick way to find out if my 2007 has a 3 pin or 4 pin radiator fan? I don't want to do this twice. Thanks! ......Saturday when I heard what sounded like a small air leak that lasted about 2 seconds after I turned off the engine. This morning, it sounded like a blade was hitting something inside the housing. Now, back to nothing... Any ideas on what else would make that kind of noise? the hissing noise is the high and low side AC equalizing when the compressor stops spinning. this noise is normal, even though you don't hear it all the time. I actually had an old 2.2 turbo Laser where the engine rolled forward and the fan hit something on the engine (thermostat housing I believe because the motor mounts were shot. Chewed up the edge of the blade, but was fine otherwise. I have never seen or heard of anything like that with a PT and believe me, my mounts are almost gone. The connector is on the lower driver's side of the fan near the radiator drain plug. Be careful, if you know Chrysler plugs, you'll know there is a red lock that needs to be moved out of the way (usually out) before the plug can be pulled. You can then easily see whether you have a 3 or four pin plug. Usually the 3 pin versions will have the relays mounted near the firewall while the 4 pin versions have the relays mounted on the fan housing on the top-passenger side. The 4 pin plug is actually part of a harness that then goes to a 3 pin plug/socket on the fan assembly itself. 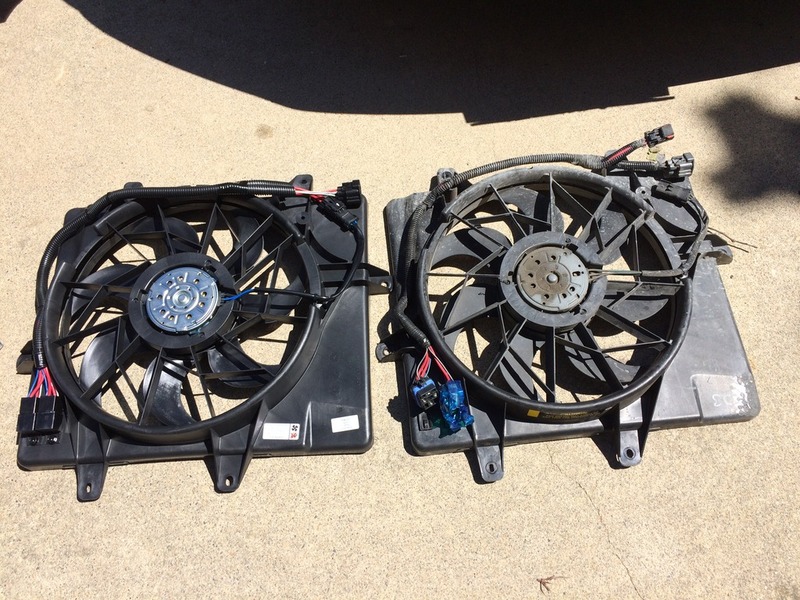 A picture of my 09 fan replacement (old one of the right). The plugs at the top are actually on the bottom when the fan is installed. Thanks! I replaced the relays this summer, and have had some experience with the locking clip on this and The Warden's 2002 Grand Caravan. Sounds like mine is a 4 pin. Any major differences in manufacturers on these? Rockauto has TYC, GPD, Spectra, Four Seasons, and VDO. The price range goes from around 65 - 95 each. I don't know enough about any of these companies to know if the quality is worth the extra cost. I think my local auto parts place has Dorman, and it was around $100.